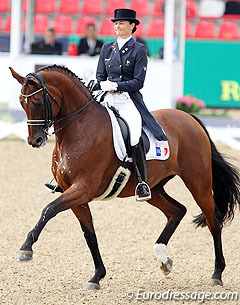 One of France's leading Grand Prix horse, Riwera de Hus, has been retired from international competition. The 13-year old Oldenburg mare will continue to be ridden lightly and will serve as brood mare at her home Haras de Hus in Petit Mars, France. The decision to retire the mare was taken in mutual agreement between the owner of the horse, Xavier Marie, and her rider Jessica Michel. "My sponsor's goals is not to be stuck at 70% in the Grand Prix but to go above it," Jessica Michel explained. "This is what drives him and why he has been investing in several talented horses for the past years. Since last year it was our goal to optimalize Riwera's weak points. It worked well, even though I was not always able to show it in the ring at the World Equestrian Games, compared to Vierzon and Deauville. This is the sport. There are good days and bad days when you are a competitor. Furthermore you can't change the nature of a horse for a 100%, even with specialized trainers. And I don't want to go against nature, especially out of respect for Riwera." Michel confirmed that even before the World Equestrian Games, she and Mr Marie agreed that Caen would be the mare's last show. "Riwera is an extraordinary mare, with an enormous heart and unlimited willingness. Compared to some of the top horses on the international circuit, her potential was limited. We knew this even though she has given it her all at the highest level," Michel added. Xavier Marie's Haras de Hus acquired Riwera de Hus as a young horse, after she competed in the Brilliant Ring at the 2004 Oldenburg Elite Mare Show and sold at auction for 150,000 euro to Sissy Max-Theurer. A few years later the mare sold to Xavier Marie. Under Jessica Michel, the bright bay mare won the 2007 French Young Horse Championships and was fifth in the consolation finals at the 2007 World Young Horse Championships in Verden. As a Grand Prix horse she was member of the French team at the 2012 Olympic Games, 2013 European Championships and 2014 World Equestrian Games. They were French Grand Prix champions in 2012. Riwera will continued to be ridden at Haras de Hus in France by Jessica, as well as by 20-year old Pauline Delaunay who can learn from her. Riwera will also be used as a brood mare for embrytransfer in 2015. Michel will continue her competition career with plenty of other horses from the yard, including the rising Grand Prix horses Socrate de Hus, Dimension de Hus and Soliman de Hus as well as young stars Don Juan De Hus, Hermes de Hus and Fusion de Hus. She also has the ride on Gandhi de Hus, a 3-year old Totilas offspring out of the clone of Poetin.